Henry Aldrich was born in Westminster, England. 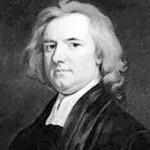 He was an English theologian and philosopher. In 1662, he entered Christ Church, Oxford, and in 1689 was made Dean in succession to the Roman Catholic John Massey, who had fled to the Continent. In 1692, he became Vice-Chancellor of the University of Oxford until 1695. He also composed a number of anthems and church services of high merit, and adapted much of the music of Palestrina and Carissimi to English words with great skill and judgment.